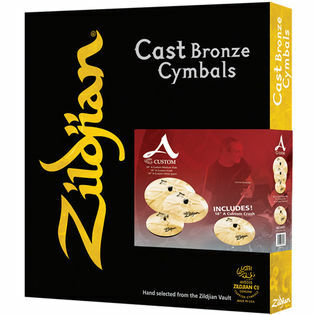 For a limited time this Zildjian A Custom Box Set includes a Free 18″ A Custom Crash. The Zildjian A Custom Box Cymbal Set features cymbals that were produced by the famous Zildjian secret process that has been handed down from generation to generation, and were hand picked from the Zildjian Vault. They are the same superior cast bronze cymbals played by the world's best drummers. Zildjian A Custom: A Refined Classic Sound. It's tough to top the unmistakable and reliable sound of A Zildjians for almost any playing situation, but the award-winning Zildjian A Customs are an irresistible alternative. Developed with the assistance of drumming icon Vinnie Colaiuta, Zildjian A Custom cymbals utilize radical rotary hammering techniques, thin to medium weights and a striking Brilliant finish for a crisp, sweet, sophisticated A Zildjian sound. Not too dark, not too bright - cymbals that are just right for modern music. My school has these cymbals for its kit. The cymbals are okay for jazz and general school-based applications, but there are certain subjective points that you may not like. The cymbals in general are fairly heavy. The sound is definitely bright in general, which is a matter of preference. Each cymbal has certain traits: --The 20" ride has a nice bright response and feels good; however, the bright sound can be a bit grating and too cutting for some jazz situations. This cymbal is heavy and bright, so it will NOT crash nicely. Crash this cymbal and the sound will haunt your nightmares. The bow is consistent and the bell is pretty clear. There is much more ping than wash on this ride. --The crashes are nice. They're pretty quick and bright. Again, the cut can be a bit much, but that's situational. You can ride on the 18" without the wash being totally overpowering, and the sound that comes from it is refreshingly warm and buttery. The crashes can be used as concert suspended cymbals if you're in a supply pinch (my school is particularly desperate). The swell does sound quite nice. --The 14" Hi-Hats are in line with the other cymbals in that they are heavy, bright and cutting. The sound is nice and crisp and the 'chick' is well-pronounced. If you like wash, there is not much. Again, not the BEST for jazz, but decent overall. Stick rebound is great with these. These would be best for Rock and Metal, in my opinion. There are certainly better options. I'm more of a Sabian guy personally, and I think the rival AAX series blows this cymbal pack out of the water. You can find an AAX pack with EXACT equivalents in size and type (14" Hats, 20" Ride, 16" + bonus 18" Crashes) here at Steve Weiss Music for 699.99 ($30 cheaper than A Custom), and they will sound better. For general purpose applications, HHX and similar series are my preference, but if you know what you're looking for, just buy what you like. Happy hunting.